Netflix has dipped its toes in reality series before with hits like Yummy Mummies and Instant Hotel, but Selling Sunset is its very first "docusoap" and although it only dropped last weekend, fans are already obsessed. 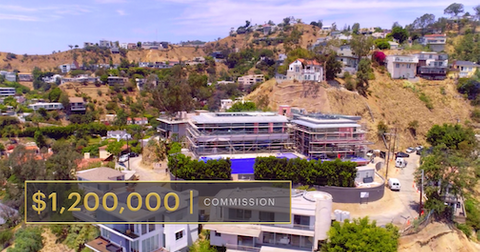 The eight-episode Netflix series follows the exclusive Oppenheim Group and the cast of beauties who work there as realtors trying to sell the most extravagant and expensive houses in the Los Angeles area. We follow Mary, Davina, Christine, Maya, Heather, and newcomer Chrishell — real estate agents at the O Group — all competing for the $1.2 million commission on a coveted $40 million property. We get glimpses at their competitive nature, personal lives, and, of course, interpersonal drama. But perhaps best of all, we get to see them take their clients into gorgeous mansions and show them through majestic properties, which is honestly our favorite part. So, will there be a Season 2 of Selling Sunset? Fans who have binged through the first season of the show over the weekend are already taking to social media to clamor for more episodes. "LOL turned on Selling Sunset on Netflix and finished the whole season today," wrote one fast fan. "Googled when the next season will come out only to find out the first season just came out today." "I'm here for Season 2," added another. Although it's still very early days for Netflix to announce whether they'll option the show for a second season, the Oppenheim Group has expressed interest and willingness in another round of filming. "That will be a decision for Netflix to make first," they said, coyly, in an interview with the UK's tabloid Express. "We resisted several overtures for a long time. Adam Divello [executive producer] was the key to our decision to move forward. At first, the cameras were a bit unnerving but we quickly became comfortable." Where is Selling Sunset filmed? This past season, we watched the Oppenheim Group take clients around the most affluent areas of Los Angeles, like the Hollywood Hills, Beverly Hills, Bel Air, Malibu, and, of course, along the famous and eponymous West Hollywood stretch of the Sunset Strip. But the real estate company is open to expanding their locations, and suggested that a new location could be possible if they come back for a second season. "Right now, we are in LA and New York City ... another office in Beverly Hills or Santa Monica might make sense in the near future," the O Group added. As for the cast of the show, we would definitely like the same ladies to star in Season 2. We can't wait to see Maya's life once she finally has her baby, get to see more of Mary and Romain's adorable relationship, and watch Chrishell balance her life as a realtor with her life as an actor. She's set to star in a Lifetime movie called Staged Killer we've already added to our list. Season 1 of Selling Sunset is currently streaming on Netflix. Will There Be a Season 3 of Netflix's 'On My Block'?